Do you have a bricked Arduino that won’t accept code anymore? Or, maybe you wrote your own firmware and would like to upload it to your Arduino? Or, maybe you just want to learn more about the inner-workings of Arduino, AVR, and microcontrollers in general. Well, you’re in luck! This tutorial will teach you what a bootloader is, why you would need to install/reinstall it, and go over the process of doing so. You may want to check out these tutorials before continuing down the bootloader path. Atmel AVRs are great little ICs, but they can be a bit tricky to program. You need a special programmer and some fancy .hex files, and its not very beginner friendly. The Arduino has largely done away with these issues. They’ve put a .hex file on their AVR chips that allows you to program the board over the serial port, meaning all you need to program your Arduino is a USB cable. The bootloader is basically a .hex file that runs when you turn on the board. It is very similar to the BIOS that runs on your PC. It does two things. First, it looks around to see if the computer is trying to program it. If it is, it grabs the program from the computer and uploads it into the ICs memory (in a specific location so as not to overwrite the bootloader). 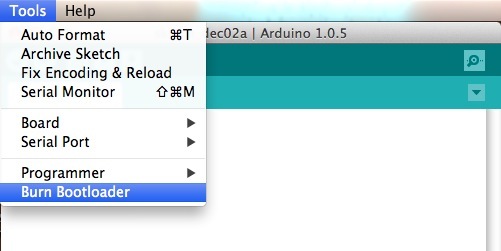 That is why when you try to upload code, the Arduino IDE resets the chip. This basically turns the IC off and back on again so the bootloader can start running again. If the computer isn’t trying to upload code, it tells the chip to run the code that’s already stored in memory. Once it locates and runs your program, the Arduino continuously loops through the program and does so as long as the board has power. If you are building your own Arduino, or need to replace the IC, you will need to install the bootloader. You may also have a bad bootloader (although this is very rare) and need to reinstall the bootloader. There are also cases where you’ve put your board in a weird setting and reinstalling the bootloader and getting it back to factory settings is the easiest way to fix it. We’ve seen boards where people have turned off the serial port meaning that there is no way to upload code to the board, while there may be other ways to fix this, reinstalling the bootloader is probably the quickest and easiest. Like I said, having a bad bootloader is actually very very rare. If you have a new board that isn’t accepting code 99.9% of the time its not the bootloader, but for the 1% of the time it is, this guide will help you fix that problem. We are going to talk about two different types of programmers you can use to install or reinstall bootloaders. 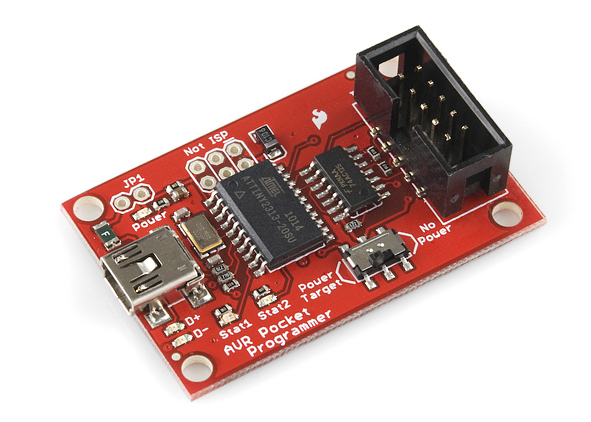 For a quick easy programmer we recommend looking into the AVR Pocket Programmer (Windows only). 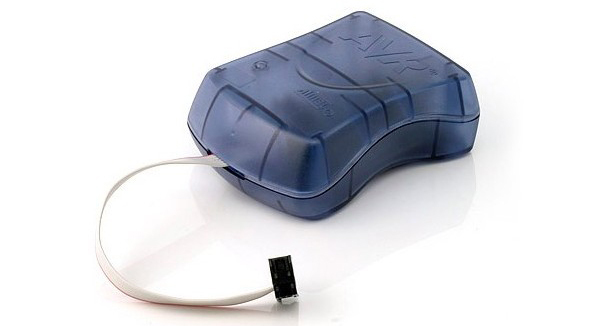 Or, you can use the official Atmel AVR MKII programmer (Now discontinued) or the Atmel JTAG ICE3 programmer. 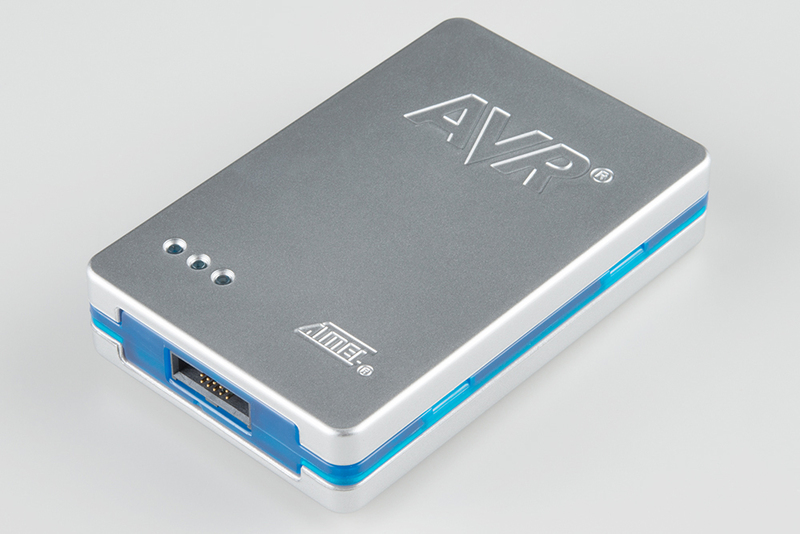 The AVR Pocket Programmer or most cheaper options will work just fine for most applications, but they may have problems with some boards, specifically ones with lots of memory like the ATMega2560 based boards. The other option is grabbing an Arduino Uno (or Duemilanove). If you go into the Arduino IDE you will see an example sketch called ‘Arduino as ISP.’ If you upload this code to your Arduino, it will basically act as an AVR programmer. This isn’t really recommended for production of boards, or boards with lots of memory, but, in a pinch, it works pretty well. Also as of this writing the code only works on ATmega328 boards. Maybe one day it will work on the Leonardo or Due, but not yet. It’s very uncommon to program ICs before they are soldered onto a PCB. Instead, most microcontrollers have what’s called an in-system programming (ISP) header. Particularly, some IC manufacturers, such as Atmel and Microchip, have a specialized ISP method for programming their ICs. This is referred to as in-circuit serial programming (ICSP) Most Arduino and Arduino compatible boards will have a 2x3 pin ICSP header on them. Some may even have more than one depending on how many ICs live on the PCB. It breaks out three of the SPI pins (MISO, MOSI, SCK), and power, ground, and reset. These are the pins you’ll need to connect your programmer to in order to reflash the firmware on your board. Here we have the Arduino Uno R3. It has two ICSP headers: one for the ATmega16U2 and one for the ATmega328. To reflash the bootloader on this board, you would use just the ICSP header for the ATmega328. On some smaller boards you may not see this connector, but the pins should be broken out elsewhere. Whether you’re using an SMD IC or a DIP IC, the ISP pins should be accessible in one form or another. Some boards might only have test points for the ISP header. If this is the case, you may want to consider getting an ISP Pogo Adapter. 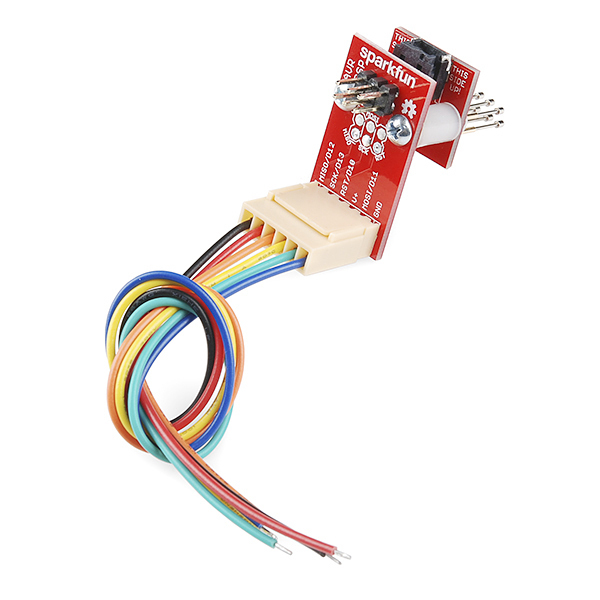 This kit allows you to temporarily make a good connection with test test points in order to reprogram your IC. ISP Pogo Adapter Kit Fully Assembled. You can connect any of the programmers we mentioned in the previous section to this board. If you are having trouble finding the ICSP pins on your particular Arduino board, you can consult this website for detailed pinouts of most Arduino related ICs and then some. Once you have located the six ICSP pins on your board, it’s time to hook up your programmer to the board. You can use a programming cable to connect the two, or, if you don’t have a cable, you can just use some male-to-female jumper wires. Here’s a table to help clarify which connections go where. 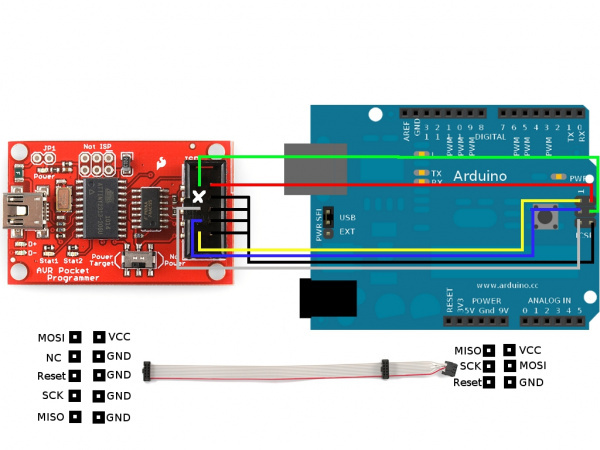 The easy way to upload the bootloader involves using the Arduino IDE. Open your IDE select the board you want to program. Then select the programmer (if you are using the Arduino as ISP you will also need to select the COM port that the Arduino as ISP is connected to). Then select BurnBootloader. This will take the board you selected and look up the associated bootloader in the board.txt file. Then, it will find the bootloader in the bootloader folder and install it. This only works if the board is installed correctly in the IDE and you have the correct bootloader. If for some reason you want to use a bootloader that isn’t installed in the Arduino IDE, visit the nest section. However, it’s probably easier to just install the bootloader from the Arduino IDE. For those who are curious about settings such as fuse bits, have no fear. 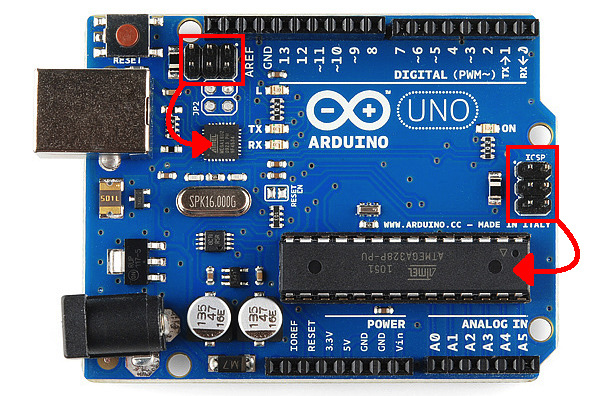 Arduino takes care of all the messy details for you when you burn bootloaders through it. The hard way is for those people who want to use the command line. This method may be more preferable if you are modifying and recompiling and don’t want to have to keep updating the IDE, but otherwise its pretty unnecessary. Again you will need to get the programmer, and hook everything up. In this example we are using avrdude on Windows. There are two steps to this process. The first step involves setting the fusebits. Fusebits are the part of the AVR chip that determine things like whether you are using an external crystal or whether you want brown out detection. The commands listed below are for the Arduino Uno using an ATMega328, they will probably work on some other similar boards such as the Duemilanove, but make sure you know what you are doing before playing with fusebits (NOTE: these fusebits will not work on a 3.3V/8MHz board). All the required fuse bits are listed in the boards.txt file for different boards, but again, if you have a boards.txt file installed then just use the Easy Way. The second step is actually uploading the program. One last bit of info. As we stated earlier, a bootloader is essintially a .hex file. Thus, you can use this method to upload and code you wish to your ICs.